PSNews - Ambassadors from four countries on April 23 jointly introduced Chief Executive Officer (CEO) of InfraCo Asia, Mr Allard Nooy, to senior government representatives from the Ministries of Finance, Planning and Investment, Trade and Industry and Transport. InfraCo Asia is a company of the Private Infrastructure Development Group (PIDG). The Ministry of Health plans to provide free biochemical tests and X-rays once every year, Minister of Health Nguyen Thi Kim Tien said during a visit to Tan Quy ward health station in Ho Chi Minh City’s Tan Phu district on April 23. Vietnam’s Foreign Ministry has coordinated with relevant agencies, the Vietnam Bar Federation, and the Embassy of Vietnam in Malaysia to implement all necessary citizen protection procedures for Doan Thi Huong to return home right after she is released. PSNews - The Hanoi authority officially pierced through the stone that had been sealed up Arch No.93 of the railway bridge along Phung Hung street to make the street open to the streets on the other side of the bridge. PSNews - The project has a total funding of about 42.33 trillion VND (US$ 1.82 billion). It will be carried out by Thua Thien-Hue province and Da Nang city from 2019 to 2020. Border guards in Ho Chi Minh City have arrested a man suspected of illegally transporting guns and ammunition from another country to Vietnam through the city port. PSNews - A book exhibition marking the 50-year implementation of President Ho Chi Minh’s testament was opened at the Academy of Politics Region II in Ho Chi Minh City on April 21. An air route using helicopters to connect Vung Tau city and Con Dao island district of the southern province of Ba Ria - Vung Tau will be launched on April 26. The tomb of King Tu Duc of the Nguyen Dynasty in the central province of Thua Thien-Hue has been digitally recorded on the Google Arts & Culture Platform to be promoted worldwide, making it the first heritage of Vietnam to be added to Google’s collection. A delegation of the Party Committee, People’s Council, People’s Committee, and Fatherland Front Committee of Hanoi on April 22 laid wreaths at Vladimir Ilyich Lenin’s statue in Lenin Park, on the occasion of his 149th birthday (April 22, 1870). PSNews - Associate Professor Tran Xuan Bach, a lecturer at Hanoi Medical University, who was the youngest Associate Professor in Vietnam in 2016, has recently been appointed by Johns Hopkins University, US as its professor. Hundreds of clean water projects have been built in the Central Highlands in recent years to serve people living in poor and remote areas. Construction of 154 Red Cross houses for disadvantaged households and families of people who contributed to the country’s revolutionary cause in Hanoi’s Ung Hoa district began with an opening ceremony on April 21. Delegates at a seminar in Hanoi on April 21 discussed the need to connect higher education institutions with businesses in training high-quality agricultural workforce. Three men of the Republic of Korea (RoK) have been arrested for running an online gambling ring worth about 8.6 billion KRW (7.3 million USD). 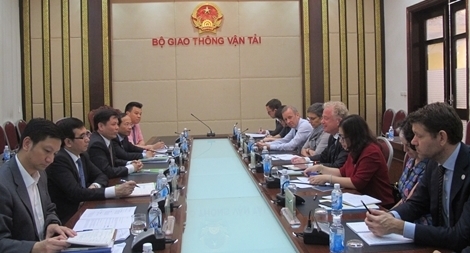 A French cultural week is being held in the Mekong Delta province of An Giang from April 19-24 by An Giang University, the French Embassy in Vietnam and the provincial People’s Committee. PSNews – The Department of Immigration of the Ministry of Public Security in collaboration with the Immigration Division of the Quang Binh Provincial Police Department, the Australia Embassy in Vietnam and the International Organization for Migration (IOM) in Vietnam have held dialogues and public information drives in Quang Binh province on safe migration and prevention of human trafficking and illegal migration. The United States Agency for International Development (USAID) and the Office of the Standing Board for the National Committee on the Settlement of Post-War Unexploded Ordnance and Toxic Chemical Consequences (Office 701) on April 20 signed a memorandum of intent that will improve the quality of life for persons with disabilities in seven targeted Vietnamese provinces - Quang Tri, Hue, Quang Nam, Binh Dinh, Dong Nai, Binh Phuoc, and Tay Ninh. The United States Agency for International Development (USAID) and Vietnam’s Air Defense Airforce Command (ADAFC) on April 20 launched the dioxin remediation project at Bien Hoa Airbase, the largest remaining hotspot of dioxin contamination in Vietnam. The project will remediate high-risk areas over an estimated ten-year period using treatment and isolation methods similar to those used at Danang Airport.